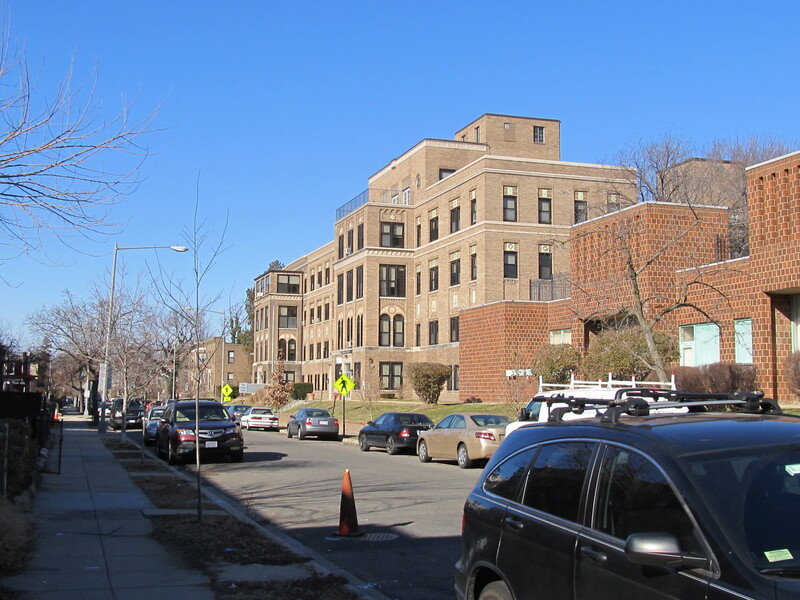 More Details and Next Steps Concerning the Hebrew Home Development | Park View, D.C. The former Hebrew Home and Robeson School site at 1125 Spring Road. After last night’s meeting (September 9, 2014) hosted by the Department of General Services (DGS), we now have a better idea of what is being considered for the redevelopment of the former Hebrew Home site (a slide deck from the meeting should be posted online soon The DCHA presentation slide deck is available here). The primary speaker at the meeting held at Raymond Recreation Center was the Housing Authority’s Stephen Green. Green reiterated the plan to renovate the historic Hebrew Home building into about 80 living units and replace the Robeson School building with new construction for a total of about 200 living units. Beneath the new construction would be a level of parking containing around 95 to 100 parking spaces. As presented, the development would include a preference for seniors for a number of studio and 1-bedroom units. Overall, the development would include a mix of studios, 1-bedroom, 2-bedroom, and a few 3-bedroom units. The estimated total development cost of the project is $50 million. The project as presented would be 90% affordable and 10% market rate, with the Housing Authority seeking a subsidy of around $18-20 million — which would be a one time subsidy coming from the Housing Production Trust Fund. In response to a question from a resident on the issue of housing vouchers, Green stated that there is no plan to include vouchers in the project, but under the Fair Housing Act anyone qualifying for a unit who has a voucher would be eligible to apply for one of the units just like anyone else. The overall timeline for the project would be for completion in 3 to 4 years. This was based on 18 months of construction and about a year to finalize plans, get zoning approval, and get through the cumbersome permitting process. The meeting was well ordered with several good questions and comments being offered. Among those were a request to consider some of the larger units for seniors who may be raising grandchildren, the need to look at how the project would impact available parking for both Raymond Elementary and Raymond Rec Center, and the need to get a good property manager for the site. Overall, those who spoke seemed receptive to the break down and amount of affordability presented. A few members of the community requested that more units be available for those at the lower income tier, and a couple residents expressed concern that a 200 unit project was too large for Spring Road. The September 9th meeting will be followed by a small working group meeting hosted by Councilmember Bowser on September 15th, from 6:30-8:00 p.m. at the Raymond Recreation Center in the Multipurpose Room on the second floor. The purpose of this meeting is to further discuss the development of the 1125 Spring Road, NW site and receive feedback regarding DGS’s proposals for the site. The small working group will assess the proposal and identify any recommended changes so as to inform Councilmember Bowser in her role as the Ward 4 Councilmember and Chair of the Committee on Economic Development. This entry was posted on September 10, 2014 at 1:01 am and is filed under Development, Housing. You can subscribe via RSS 2.0 feed to this post's comments. “Under the fair housing act anyone qualifying for a unit who has a voucher would be eligible” – so to get the true income requirements of the units, subtract $15,000, and don’t forget about personal exemptions. Not against affordable housing, just like honest debate and also don’t like how the large affordable only developments are all being moved to Georgia Avenue Metro area without adding an equal number of market rate units. A community cannot be sustained on so much subsidization. this is not very feasible. Who is going to rent the market rate units in what is essentially 90% very low/voucher income building? based on previous meetings I attended this doesn’t seem to reflect what the residents close by supported at all. That is a fair point about the market rate being so low in comparison. Are there any local examples of 10% or under market rate having demand? It seems that a modest bump in market rate might balance it out and appease the neighbors that have those concerns. It would still leave the area with over 150 new well-located affordable units which did not exist before. Looks like this will be another Cavalier…what is it called now, the Hubbard? at 3500 14th street. I have concerns that this unit is too big for Spring Rd. I get the Hebrew Home, but another 200 units in the adjacent lot? Too much. And right across from the school and Rec Center (where there was just a gun discharged) seems to be pushing it. The plan is for 80 units in the Hebrew Home and another 120 units in the adjacent lot. And, this site is 0.3 miles away from the heavy rail mass transit Georgia Ave metro rail station, which is capable of carrying tens of thousands of riders to and from the neighborhood in a single hour. 200 units – not too much. Wait a gun was recently discharged at Raymond?!?!?!?! Please share more details as my toddler goes there often! I just want to inform all on this site that the allegation about a gun being discharged at Raymond Recreation Center is inaccurate. At Raymond, we do our best to ensure that all of our patrons are safe. We’d appreciate it if divisive talk that only paints a center that is doing EVERYTHING possible to create an atmosphere of peace in a negative light, be quelled. So it’s going to be low income/affordable housing. As stated above, this does not reflect what the residents close by supported. Show the results of the survey again. 70% of respondents wanted 0-25% affordable, 75-100% market rate.